His Highness Shaikh Nasser bin Hamad Al Khalifa, Representative of His Majesty the King for Charity Works and Youth Affairs, Chairman of the Supreme Council for Youth and Sports, President of Bahrain Olympic Committee (BCO) deputised HE Hesham bin Mohammed Al Jodar, Minister of Youth and Sports Affairs to crown the winners of Nasser 10 Football Tournament in the presence General Secretary Mr Abdulrahman Askar, Shaikh Ali bin Khalifa Al Khalifa, President of the Bahrain Football Association (BFA) and members of the High Organising Committee, headed by Mr Tawfiq Al Salehi. Batelco Gunners United won the title for the first time after emerging 2-1 victors in the final game against Al Fakhar. 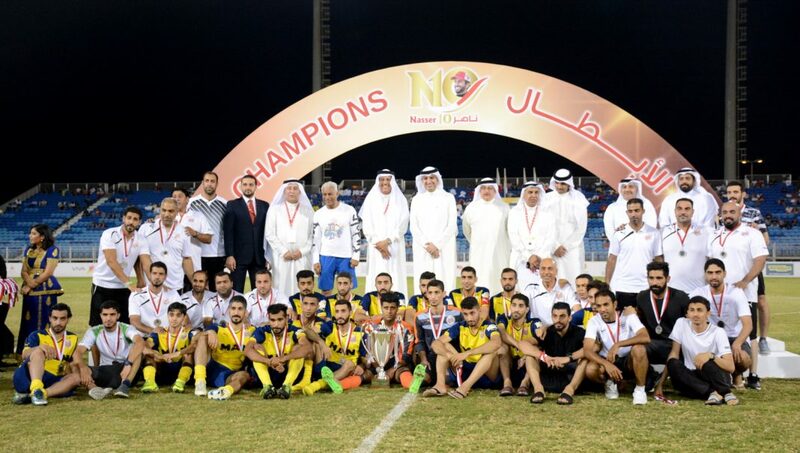 HE Mr Al Jodar presented the victory medals to the winners and also the first place up. The Minister also handed the second place medals to the runners-up and rewarded the referees who officiated the match. On this occasion, His Highness Shaikh Nasser bin Hamad Al Khalifa stressed that the success of the 10th edition of this prestigious tournament, which embraced various sports events, was a real result of the outstanding effort and organised teamwork that delivered the message of noble goals to all young Bahrainis. His Highness Shaikh Nasser noted that the qualitative shift of the tournament in its first decade and the success achieved urge everyone involved to maintain their efforts in order to the event to the highest level, regionally and internationally. His Highness Shaikh Nasser said that the tournament wouldn’t stop at this stage of development. Moreover, HH Shaikh Nasser congratulated the winners of the tournament, applauding the sports spirit that permeated all the matches of the tournament. On his behalf, Batelco Gunners United captain Shaikh Khalid bin Salman Al Khalifa dedicated winning the title of Nasser 10 to the Honourary President of the team HH Shaikh Mohammed bin Salman Al Khalifa and the team sponsors, on top of which Batelco. “Our most important aim was to reach the final, and then came the bigger goal which was to win. This was the third time for us to reach the final and it was the third time is a charm. We lost the previous two in the penalty shootout, and we didn’t want to reach this stage,” Shaikh Khalid said. It’s worth noting that Brazilian player Diego won the top scorer of the tournament after amassing seven goals. He was the winner of this award last year, scoring 10 goals.